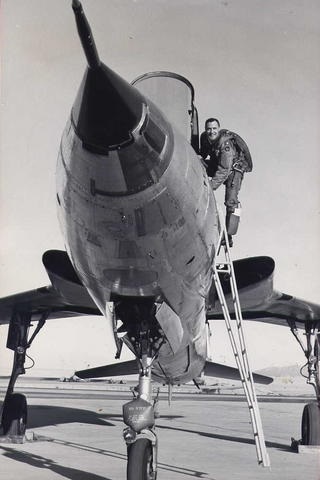 11 December 1959: Brigadier General Joseph H. Moore, U.S. Air Force, Wing Commander, 4th Tactical Fighter Wing at Seymour Johnson Air Force Base, North Carolina, set a Fédération Aéronautique Internationale (FAI) World Speed Record when he flew a Republic F-105B-20-RE Thunderchief, serial number 57-5812, over a closed 100-kilometer (62.137 miles) closed course at Edwards Air Force Base, California. The Thunderchief averaged 1,878.67 kilometers per hour (1,167.35 miles per hour).¹ General Moore’s fighter bomber was a standard production aircraft and it was armed with a full load of ammunition for the M61 cannon. The F-105 was the largest single-seat, single-engine combat aircraft in history. It was designed as a tactical nuclear strike aircraft and fighter-bomber. The fuselage of the F-105B incorporated the “area rule” which gave the Thunderchief its characteristic “wasp waist” shape. The Thunderchief was 63 feet, 1 inch (19.228 meters) long with a wingspan of 34 feet, 11 inches (10.643 meters). It was 19 feet, 8 inches high (5.994 meters). wings were swept 45° at 25% chord. The angle of incidence was 0° and there was no twist. The wings had 3° 30′ anhedral. The total wing area was 385 square feet (35.8 square meters). The F-105 had an empty weight of 25,855 pounds (11,728 kilograms) and a maximum takeoff weight of 50,000 pounds (22,680 kilograms). Brigadier General Joseph H. Moore with a Republic F-105 Thunderchief. 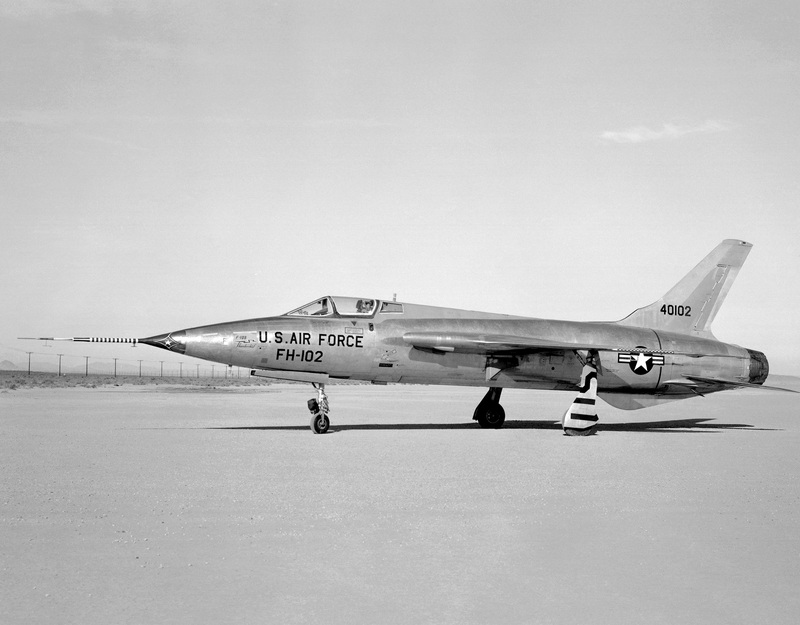 Early production F-105Bs had the Pratt & Whitney J75-P-5 axial-flow turbojet engine. Beginning with the Block 20 aircraft, the more powerful J75-P-19 was installed. The -19 engine was retrofitted to the earlier aircraft. The Thunderchief was powered by one Pratt & Whitney J75-P-19W engine. The J75 is a two-spool axial-flow afterburning turbojet with water injection. It has a 15-stage compressor section (8 low- and and 7 high-pressure stages) and 3-stage turbine section (1 high- and 2 low-pressure stages.) The J75-P-19W is rated at 14,300 pounds of thrust (63.61 kilonewtons), continuous power; 16,100 pounds (71.62 kilonewtons), Military Power (30-minute limit); and Maximum Power rating of 24,500 pounds (108.98 kilonewtons) with afterburner (15-minute limit). The engine could produce 26,500 pounds of thrust (117.88 kilonewtons) with water injection, for takeoff. The J75-P-19W is 21 feet, 7.3 inches (6.586 meters) long, 3 feet, 7.0 inches (1.092 meters) in diameter, and weighs 5,960 pounds (2,703 kilograms). Armament consisted of one 20 mm General Electric M61 Vulcan six-barreled Gatling gun with 1,080 rounds of ammunition. It had an internal bomb bay and could carry bombs, missiles or fuel tanks on under wing and centerline hardpoints. The maximum bomb load consisted of four 750-pound (340 kilogram) bombs. For tactical nuclear strike missions, the F-105B could carry one Mk-28 “special store” in the internal bomb bay. The F-105B had a maximum speed of 737 knots (848 miles/1,364 kilometers per hour) at Sea Level, and 1,204 knots (1,386 miles per hour/2,230 kilometers per hour) at 35,000 feet (10,668 meters). The service ceiling was 45,700 feet (13,929 meters). Maximum range was 2,006 nautical miles (2,308 statute miles/3,715 kilometers). Republic Aircraft Corporation built 833 Thunderchiefs for the U.S. Air Force. 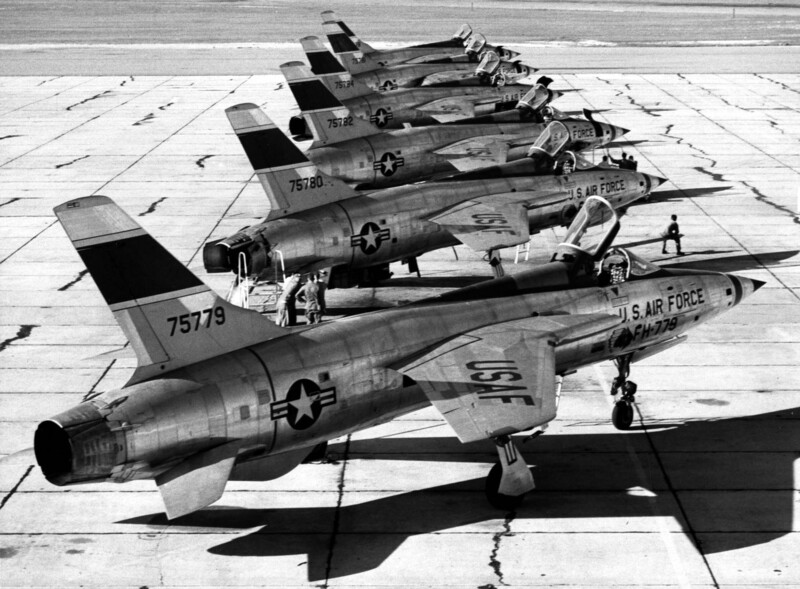 75 of those were F-105Bs. 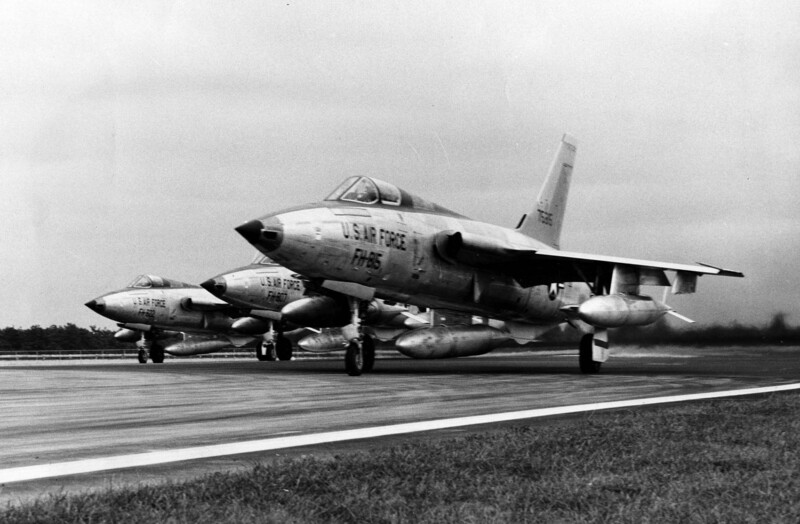 372 F-105s were lost to enemy action in South East Asia. Republic F-105B-20-RE Thunderchief 57-5812 served with the 119th Tactical Fighter Squadron, New Jersey Air National Guard, and was later assigned to the 466th Tactical Fighter Squadron, 508th Tactical Fighter Wing at Hill Air Force Base, Utah. One source indicates that the the record-setting F-105B was used as a battle damage repair trainer at McClellan Air Force Base, Sacramento, California, from October 1980. 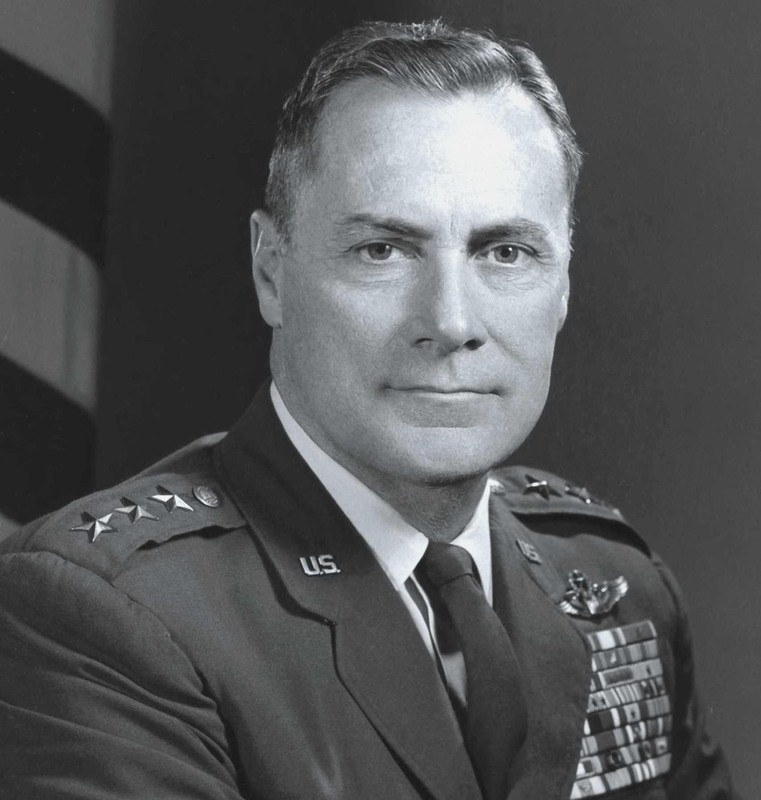 ¹ Many sources cite General Moore’s World Record Speed for the 100-kilometer closed course at 1,216.48 miles per hour (1,957.745 kilometers per hour). The FAI’s official web site gives General Moore’s speed as 1,878.67 kilometers per hour (1,167.35 miles per hour). (See above.) Also, many sources (including General Moore’s official Air Force biography) state that General Moore won the Bendix Trophy for this flight. The Bendix Trophy was awarded to the winner of an annual West-to-East transcontinental air race. The Smithsonian Institution indicates that the Bendix Trophy was not awarded for the years 1958, 1959 or 1960.